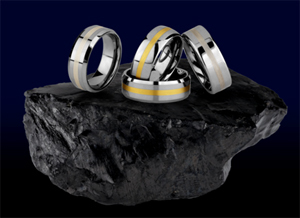 Although we specialize in tungsten wedding bands, all of our staff here at Tungsten World is well versed in all things “wedding.” Our tungsten rings may be the alternative metal, but for those interested in combining the durability of tungsten with a more traditional metal like gold or silver we have our line of inlay tungsten rings. Whether it’s silver, gold, platinum or even palladium you desire in your wedding band, you’ll find a wide array of inlay styles on our site. This page will help educate men and women that want to know a little bit more about the types of tungsten inlay rings we have to offer. No matter your preference, these inlay rings make a great wedding band for a man or a woman. One of the traditional metals used since ancient times, silver has a rich history in jewelry. It is the softest of the precious metals, and the most reasonably priced. All of our silver inlay tungsten rings use the highest quality silver for the inlay. Our silver inlays are classified 925 Sterling Silver, meaning of the 1,000 parts that make up the inlay, 925 parts are pure silver. 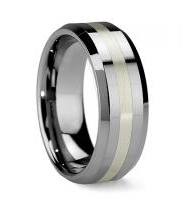 A great example of a tungsten ring with silver inlay is the Xenon. It is one of our beveled tungsten rings with 2mm sterling silver inlay, and probably the most popular inlay band on the site. The most traditional metal used in wedding bands. Gold is slightly harder than silver, and comes in many different color variations. All of our gold inlay tungsten rings use 18 karat gold, making the inlay high quality without the downside of the softness of 24k gold. Yellow gold is offered as the standard gold inlay on our site, but we can also have rose, white and green gold inlaid rings made at your request. Have a look at our Helios. This domed gold inlay band is accented by the 3mm wide brush stripe applied to the center. It’s an update on a relatively classic style. 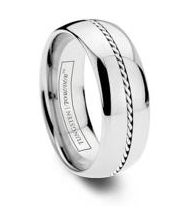 Platinum has recently become very popular in wedding bands. It is the hardest of the precious metals, and as a result the most durable of precious metals. 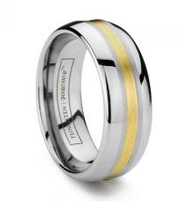 All of our platinum inlay tungsten rings use 950 platinum. This high grade of platinum means that of 1,000 parts used to make up the platinum inlay 950 parts are pure platinum. The Ptolemy is one of our hand woven platinum inlay rings. It’s a bit of a twist on the traditional inlay, but stylish nonetheless. Each inlay type has its own similar hand woven style. The Ptolemy is the perfect combination of classical metals, classical styling with a modern update. Very similar to platinum, you can select palladium for your ring’s inlay. In the same family as platinum, palladium is also a harder precious metal and similar in color to platinum but slightly less expensive. Just another of the many options you have when picking out a tungsten ring with inlay. And if you aren’t seeing something you’d like, give us a call. We’d be happy to see if we can have something made custom for you.